Despite the economic crisis, customers can still afford to pay 390,201 for a Maybach ultraluxury sedan. DETROIT -- Despite the global economic crisis, no customers have canceled their Maybach orders. The custom hand-built models start at 390,201 in the German market for the Maybach 57, and can top 1.07 million for the 62S Landaulet, which features a soft top that rolls open for the rear-seat passengers. It typically takes five to seven months to build each car after an order is placed. Maybach sold about 300 vehicles globally last year, down from about 400 in 2007, Lenz said. The assembly plant in Germany has a 2,000-unit capacity, Lenz said. The US market currently accounts for 40 to 50 percent of global sales of the Maybach. Dieter Zetsche, CEO of parent company Daimler, said last year that despite the low sales, Daimler had no plans to kill the Maybach brand, because it was not losing money. Lenz would not say whether the Maybach range would be redesigned next decade. But he said the current models styling could be in the market for 10 years. 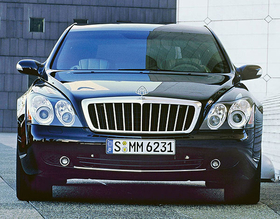 Maybach sales began in 2003. While other brands, including Mercedes-Benz, are looking into alternative powertrains, Lenz said Maybachs customers are not demanding hybrids, for example.